Seriously, take a walk, perhaps just as far as your backyard. Optimally, you find sticks that are dried out, even hollow, yet not so brittle that they will split when cut. Or too hard. Forget old bamboo, dangerous. But green bamboo or reed types would work. Just pick more sticks than you need, because you may lose a few. I did. Just make a few long carves with the knife edge along the end you choose for the nib. Go slow, no hurry here, and get closer and closer to the opposite edge without weakening it. Look closely at the pics above for ideas about this. And after all they are just sticks, so don't worry if you munch a few. I also, on this batch, sliced a slit down the end of the nib. Maybe 1/2 inch or so, depending on the stick. It helps the pen to hold more ink. My suggestion is to hold the nib front side down on the board, then slice thru that way. Once you start drawing with your stick you will know what type of nib you enjoy the most. 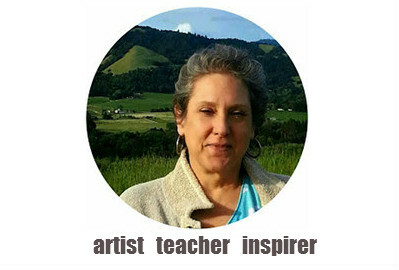 It's different for each of us artists. paints, any acrylic paint, paint pen if you like, craft paints are fine. I also used some of my black acrylic ink. Make different nibs, that is, cut some off straight for more calligraphic effect, and a couple pointed nicely. I do refine my nib ends with a sanding sponge at end. And sometimes I sand slightly the branch so that it feels smooth to my hand. Bottom left picture, this is the position to have the nib/stick in when SLICING a center line. Hope that makes sense! these are unfinished, but do have my favorite stripes and dots. i will get around to finishing these soon. you can see that i have already initiated one of them! 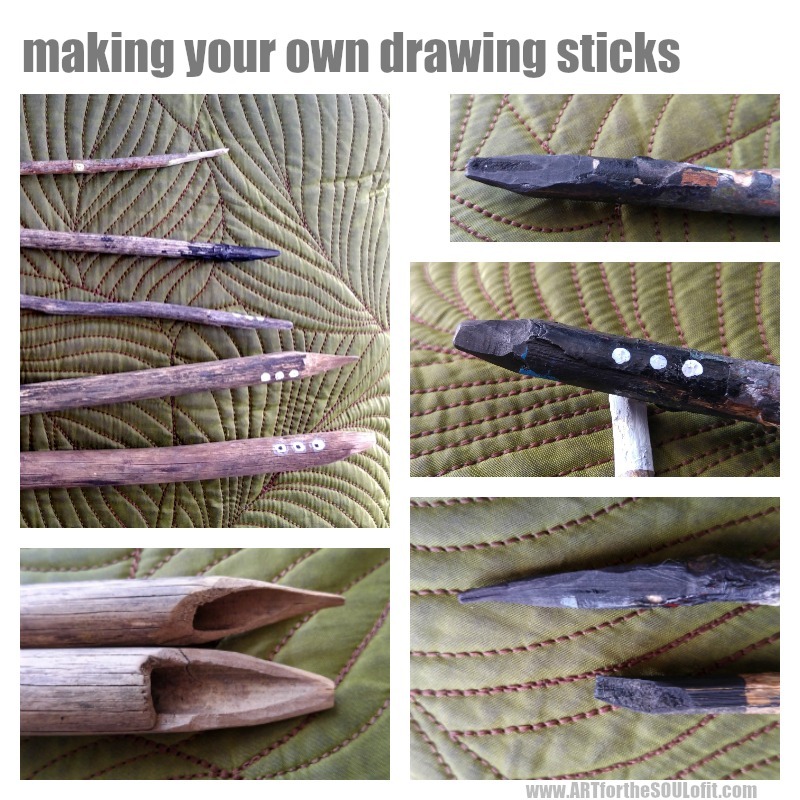 Hope you enjoy making drawing sticks as much as I do! And just dip it in ink and have some wonderfully unpredictable glorious marks when you sketch. Let me know how you like this project by commenting below. Thanks! I remember when I lived in New Mexico. Had a stand of bamboo in the yard. This came process can be applied to bamboo. It makes excellent drawing implements. I still have and use some of the ones I made over a decade aoo. 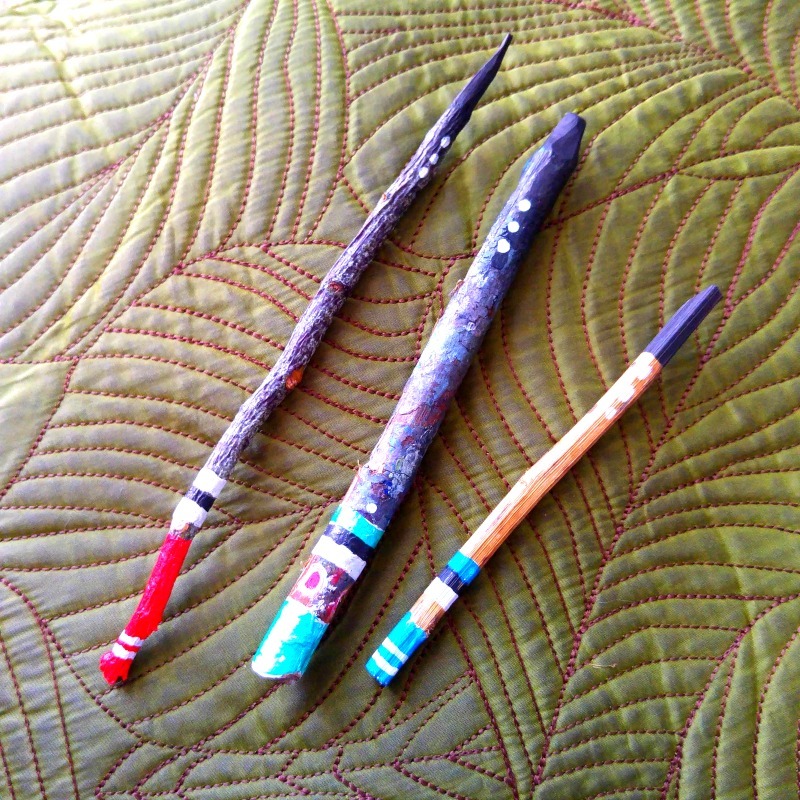 Hi Margaret, I have purchased a handful of bamboo "pens" (really carved sticks) from the art store, and they are wunderbar! 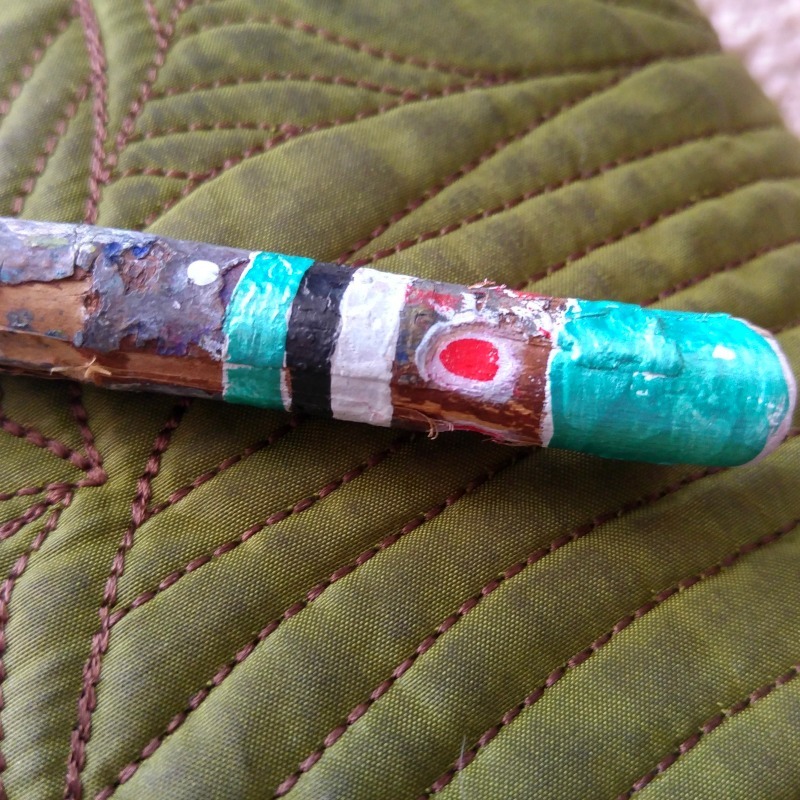 However, when I tried carving into a bamboo garden stake I had laying around it didn't take long to realize I would be cutting off some fingers if I had continued. So dang impenetrable! So I bet that fresh bamboo growing in your yard was just perfect. Thanks for popping in! What a wonderful idea! 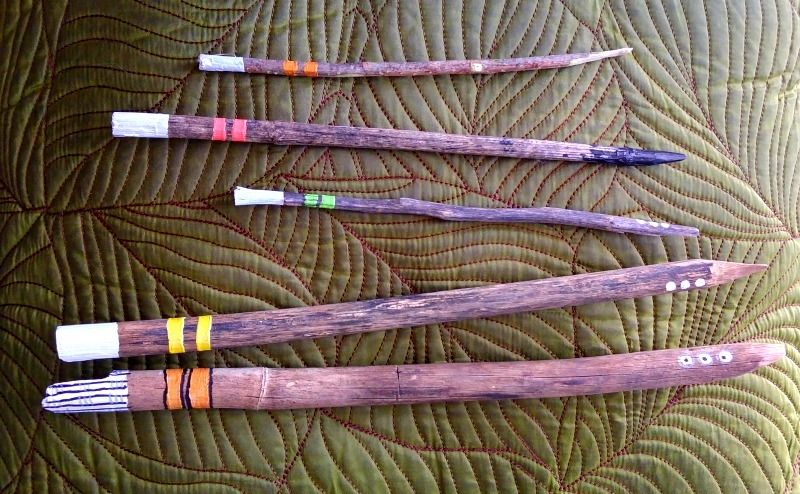 The sticks themselves have become things of beauty. I won't just be looking for magickal wands next time I'm in the woods. thanks Joanie. Aww they are adorable and so inspiring to try to carve my own! Will see if I find time to give it a try! Thank you for this gorgeous post! Thanks for stopping by, Pia. 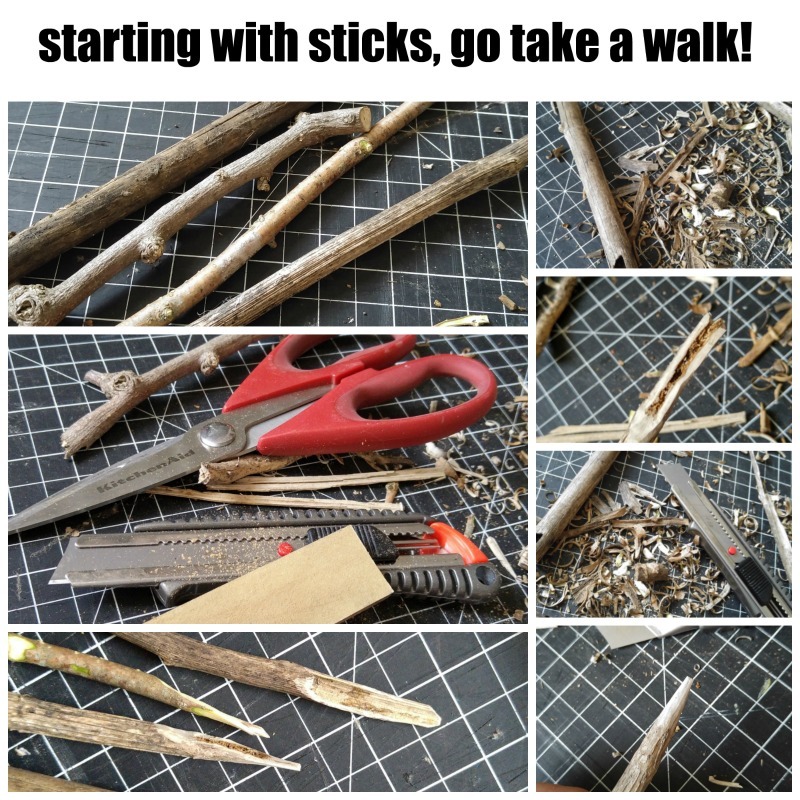 Yeah, a short little walk, or maybe even sticks will just appear at your door! Enjoy the magic of wild ink on stick lines.